“I haven’t worked a day since 1966!” — Roland Johnson, 2015. In 1967, he began his first baseball-related job, and within 10 years he began his career as a scout. His more than 40 years in scouting have included more than 30 years with the New York Mets, for whom he served as Director of Scouting when the Mets won the World Series in 1986. Almost 30 years later he could be spied in his familiar post in the seats behind home plate, scouting Class-AA talent for the Mets as the 2015 minor-league season drew to a close in New Britain, Connecticut. Baseball scouts travel extensively and it is somewhat ironic that Johnson has spent his final years as a scout watching games a close distance from his lifelong home in Newington, Connecticut. Roland T. Johnson was born in Newington on November 7, 1940. His father, Torsten Johnson, and mother, Anna Kindur Johnson, had come to the United States from their native Sweden when they were in their early 20s. Torsten was a machinist at Pratt and Whitney and Anna mostly stayed at home. Roland was the youngest of three siblings following two older sisters, Lily and Carol, into the world. Roland’s mother Anna lived a rich full life, passing away in 1998 at the age of 94. Roland had a lifelong interest in sports and played three sports while in high school. When he was not playing himself, he played board games and kept statistics. In addition to baseball, he played soccer and basketball. At Newington High School, he was a pitcher and third baseman. He went on to attend Trinity College in nearby Hartford, where he was converted to catcher in his junior year and captained the team in his senior year. At Trinity he played for coaches Dan Jessee and Robbie Schultz. After graduating, Johnson had a shot to play professional ball with the Springfield (Massachusetts) Giants in the Class-A Eastern League. He tried out for the club and was given an offer. However, the team already had two catchers, Bob Barton and Denny Sommers. At the time, Barton, who had injured his leg on June 12, was on the disabled list, and would not return until July 5. Johnson was told by friends that he could be let go once Barton returned to the lineup. Hence, Johnson decided to turn down the offer and continue to play in the Hartford Twilight League while seeking employment outside of baseball. Johnson married Judy Lauritzen on September 7, 1963. She had gone to Conard High School in nearby West Hartford, and was an x-ray technician at Hartford Hospital. They have two children, Jennifer and Michael, born in 1969 and 1971, respectively. They also have six grandchildren. In those days, Hartford was still the Insurance City and Johnson, who had majored in Economics at Trinity, took a position with Factory Insurance Association as an underwriter. He moved on to the Hartford insurance Group. But insurance was not for Johnson. He commenced a letter writing project, hoping to get some kind of a job in baseball. In 1965, he saw an ad in The Sporting News saying “Wanted: Baseball Nut.” He answered the ad, received a response and ultimately, in 1967, was hired as a researcher by a group that was producing a 2,500 page baseball encyclopedia. He worked with SABR’s David Neft. Johnson, Neft, and two other researchers traveled the country, cross checking statistics and going through old newspapers. Johnson remembers one of his tasks was to compile RBIs prior to 1920. The Baseball Encyclopedia was published in 1969. After the book was published, Johnson went back to Connecticut and took a position with the Travelers, but it was not long until he was back into baseball research. The three men with whom he had worked on the Baseball Encyclopedia had gone on to work at Sports Illustrated in their games division, and invited Johnson to join them in Darien, Connecticut. They went on to form their own publishing company, Sports Products, Inc., putting out a number of books, including a smaller baseball encyclopedia entitled The Sports Encyclopedia: Baseball. They also produced a book entitled Scrapbook History of Baseball. Johnson opened up an office in his home town of Newington, allowing him to process mail orders and do further research. However, he had some extra time. He was encouraged to check into part-time scouting and got a response from Dave Bartosch from the St. Louis Cardinals. Bartosch had a cup of coffee with St. Louis in 1945, and scouted for the Cardinals from 1969 through 1979. 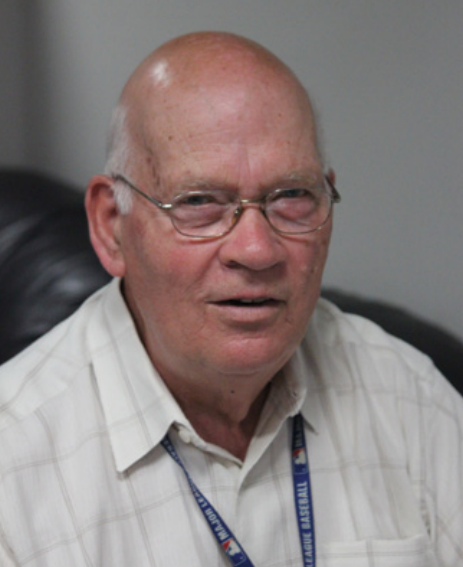 Johnson started working part-time from 1973 through 1976, earning $50 per month. He became a full-time area scout with the Cardinals in 1977, covering New York, New England and New Jersey, and sold out his interest in the publishing company. He was with the Cardinals through 1982. During that time, he became friendly with Joe McIlvane, the scouting director of the New York Mets, and he joined the Mets after the 1982 season, as a cross-checker, going around the country comparing high school and college prospects. At the pre-draft meeting in 1983, Johnson, who had just come from the Cardinals to the Mets, was approached by Mets General Manager Frank Cashen. Keith Hernandez was available, and Cashen sought Johnson’s opinion. Johnson applauded the idea and the Mets were able to obtain Hernandez in a trade for Neal Allen and Rick Ownbey. Less than two years later, at the 1984 Winter Meetings, another name came up when GM Cashen was meeting with Murray Cook, his counterpart with the Montreal Expos. Although Johnson’s focus, at the time, was on high school and college prospects, he was pleased to see the Mets obtain another piece of their 1986 mosaic, trading Hubie Brooks, Mike Fitzgerald, Herm Winningham, and Floyd Youmans to Montreal for Gary Carter. There was one member of the 1986 Mets that Johnson scouted during his time with the Cardinals. This fellow pitched at Yale and Johnson still remembers the epic pitching duel between Frank Viola of St. John’s and Ron Darling of Yale. It was the best college game that Johnson ever saw. In the 1981 draft, the White Sox were picking seventh and the Cardinals were picking eighth. The Cardinals had two players in mind. At the top of their list was Bobby Meecham. If he was not available, the Cardinals would have drafted Darling. The White Sox selected Daryl Boston, the Cardinals selected Meecham, and the Texas Rangers, picking ninth, selected Darling. By the time Johnson joined the Mets in 1983, Darling was in the New York organization. The Mets acquired Darling, along with Walter Terrell, in a trade for Lee Mazzilli prior to the 1982 season. In talking about 1986, Johnson is quick to draw a comparison between the 21st century game and the game as played in 1986. The 1986 Mets team essentially had only nine pitchers on the roster, something never heard of in later years. Starting pitchers went deeper into games and the closer role had not yet fully developed. A reliever would come in when needed and would pitch as many as four innings. With five starters and four relievers, the Mets cruised to a 108-54 record and went on to win their League Championship Series and the World Series. Johnson remembers the leadership of Hernandez and Carter, and “dirt players” like Len Dykstra, Ray Knight, and Wally Backman. Johnson and his wife Judy traveled with the team during the 1986 postseason. In Game Six of the World Series, they were back in New York at Shea Stadium. As the Mets fell behind, and the game entered its final innings, Judy couldn’t bear to watch anymore and she went to Johnson’s office to wait. The room was not near the field, and was eerily quiet. All of a sudden, through the walls, she could hear the loudest of noises. She turned on the television and the Mets had won the game. Meanwhile Rollie was upstairs in the stadium watching Haywood Sullivan and Lou Gorman of the Red Sox to see their reaction as, with two outs in the bottom of the ninth inning, victory was at hand. He expected to see an emotional victor. He wound up seeing the passive face of defeat. The Red Sox were all but dead with one game remaining. Johnson is quick to share his stories of his years in scouting. One of his favorites dates back to 1979 when he was an area scout with the Cardinals. A player from New Hartford, New York appeared on the radar and Roland went up to take a closer look, and was convinced that he should be a first-round draft pick. This kid was such a fabulous athlete that he was offered a football scholarship at Penn State and a basketball scholarship at Syracuse. The cross-checkers came in and concurred with Johnson’s appraisal. Time came for the final evaluation. It was a hot 85-degree day and Andy Van Slyke showed up for the tryout in just shorts and a t-shirt. Johnson also noticed that Van Slyke had welts on his forearms. His performance was not good. After the tryout, Johnson found out that Van Slyke had boxed four rounds the evening before, to take his mind off baseball, and those welts, which hindered his baseball swing, came from the boxing match. The Cardinals, despite the one bad workout, elected to draft Van Slyke, making him their first pick (sixth overall) in the June 5, 1979 draft. The next day, Van Slyke played for his school in the State Championship game, and verified Johnson’s faith in him—until he broke his wrist late in the game, tripping over first base when running out a base hit. The Cardinals brought him into St. Louis for an evaluation, signed Van Slyke, and he went on to a 13-year major-league career, winning five consecutive Gold Gloves with the Pirates. Not all of Johnson’s sightings became first-round draft picks. The Mets used their pick in the 44th round of the June 3, 1991 draft on an outfielder from Illinois. The local scouts saw something in the player’s arm and thought he could make a good pitcher. Johnson, who was the Mets Director of Scouting at the time, dispatched one of his surrogates to check the kid out. Jason Isringhausen went on to pitch 16 major-league seasons, emerging as one of the top relief pitchers of the first decade of the 21st century. During Johnson’s tenure as Director of Scouting with the Mets, there were several notable draft picks including Todd Hundley in 1987. Johnson also remembers drafting Curtis Pride on the recommendation of an area scout. Pride was 95% deaf, but a great athlete, and a greater individual. He played in parts of 11 major-league seasons, and in recent years has led an exemplary life. Johnson also remembers with a great degree of respect his boss Frank Cashen. Cashen would not interfere in scouting decisions. The scouts, in 1986, decided to use their first draft pick on Lee May, Jr., son of the of former Astro and Red first baseman. Unfortunately the draft pick did not work out for the best as May only made it as far as Class AAA in seven seasons in the Mets minor league system. Johnson also is grateful to Cashen for his role in extending the pension plan to non-uniform personnel including scouts, in 1979. Johnson, after serving as Director of Scouting through 1992, went back to cross-checking in 1993 and moved on to a role as a professional scout in 1997. On July 22, 2015 following a Binghamton Mets visit to New Britain, Johnson filed his reports and, the next day, Michael Conforto, joined the parent club in its return to glory, 29 years after Johnson had served with the 1986 Mets as Director of Scouting. The author conducted a formal interview with Roland Johnson on August 27, 2015. The author also used the Hartford Courant and Baseball-Reference.com.